KYB’s Products From advanced hydraulic technology to electronics, KYB products support comfort and safety in all industries. Our line of KYB industrial machinery components help to speed up production, from elevators to factory equipment. The MMP is a hydraulic linear actuator which integrates an electric motor, hydraulic pump, valve and cylinder. It sees use for saving power and automation in several fields, as well as for improving office and residential environments. Stops moving objects smoothly such as overhead cranes, elevators or transportation facilities by absorbing impact. Provides safety in machinery and equipment. Small Axial Piston Pumps One of the world's smallest high pressure axial piston pumps, these pumps can be mounted in tight spaces. They can cut energy consumption in new markets, such as industrial and manufacturing machinery. Small Axial Piston Pumps Unit This pump unit makes use of the world's smallest size high-pressure axial piston pump. The pump itself is equipped with a valve and tank function, making it easy to use. A safety valve（release valve）is part of the standard equipment. 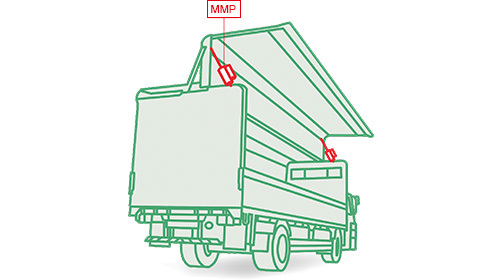 Reduces impact to stop a moving object and prevents damage to the equipment and reduce noise. Used in a variety of fields. Compact and has a nearly constant spring force provided by gas. These springs have characteristics that make them suitable for opening/closing doors.